“if it’s not the best sunset you’ll see this week you can punch me in the balls”. The central hub for a lot of things during the week would be either Treadly bike shop, or the host of top notch coffee spots within their intimate and beautiful pocket of the Adelaide CBD. For the umpteenth time running, it would also be our meeting point for the ride, a chance to say hello to some new friends, and catch up with old who may have been busy getting amongst the “bulk kays” over the last week. If there was to be a ride defined as the complete opposite to a smash fest, this would be it. While there’s no specific dress code, more often than not the most casual examples of casual attire are the most common choice. 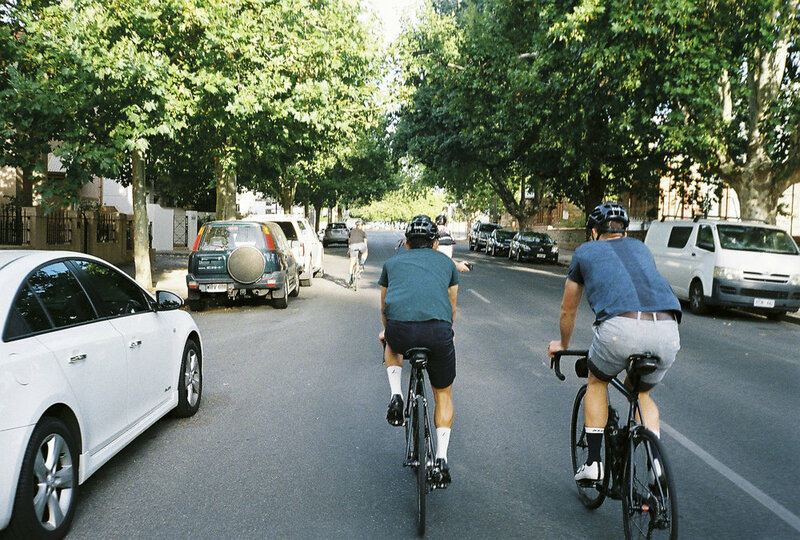 Casually weaving through the suburbs along back streets and bike ways, occasional stops are made for drinks and fish and chips to bring to the top, musettes over the shoulders doing all of the heavy lifting. Every year there are subtle changes to the timing, and to the route on our way to the top of Mount Osmond. This year there was a choose your own adventure option of either taking the pure tarmac streets to the top, or alternating with a sneaky all-terrain mission to the top via the Pioneer Women’s Trail. Temperatures that weren’t so smouldering and knowledge that nobody would be out there monitoring power data meant that either way was a chill affair, the trail still proving to be somewhat road bike friendly up to our grassy knoll at the top. Our arrival was met by a sun still hiding behind the clouds, but eager to come out. The ever-warm weather mixed with a short but steep climb making the refreshments in our feed zone bags all the more enjoyable, while others arrived with communal snacks of biscuits, potato cakes, chips and lollies. Nick, who has lovingly captured all these photos via 35mm film snapped the exact moment June herself heard the rustling of yesterdays newspaper as fish, chips, potato cakes and dim sims were opened, the smell filling the air. 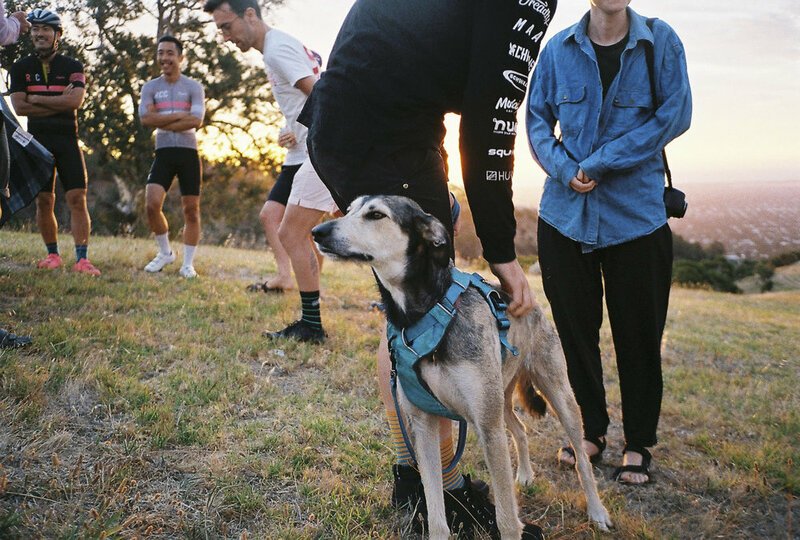 With some music lightly filling the air and June the pup all to eager to get friendly amongst passers by, the sun slowly crept out from behind the clouds, gifting us with – low and behold – the best sunset we would see all Tour Down Under. The wind began to pick up and get colder and colder, but the way the setting sun turned the sky pink, and lit up the ridgeline along Greenhill Rd behind us was too beautiful to simply bail for lower ground. Once again, this time on a Saturday, a sunset trip to Mount Osmond with friends, our biggest group of friends yet, proved to be one of the true calming and loving moments of the Tour Down Under, the sunset turning full blown majestic to ensure nobody would be getting punched in the balls.